The whistle of a train—that unmistakable, lone mournful whistle—announced a cold reality: the last president of the Greatest Generation is gone. This same mournful whistle provoked stirrings within me. 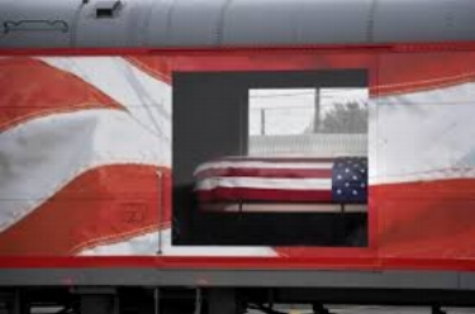 Memories of George Herbert Walker Bush move down the tracks of my mind. George H. W. Bush signed the ADA act. [Americans with Disabilities]. Because of his vision for those with disabilities, my own daughter’s boundaries are broader. And now I sign legislation, which takes a sledgehammer to another wall, one which has for too many generations separated Americans with disabilities from the freedom they could glimpse, but not grasp. Once again, we rejoice as this barrier falls for claiming together we will not accept, we will not excuse, we will not tolerate discrimination in America. He ended with, I now lift my pen to sign this Americans with Disabilities Act and say: Let the shameful wall of exclusion finally come tumbling down. God bless you all. Thank you. Thank you, George Herbert Walker Bush. Silently, respectfully, I stand as the mournful whistle blows; I am grateful to have called you My President. What memory do you have of President Bush? Which habit or character quality of his do you value and desire to emulate? Note: If the British know how to do weddings, I venture to say that Americans know how to do funerals.